For many people Ireland is on their bucket list – you know the list you have of places you want to visit, books to read and things to do before the great maker calls you home? But if Ireland is on your list, surely there is more to it than just standing in Dublin airport, ticking Ireland off your list and heading straight back on a plane to your next “bucket destination”? What should you see,do, drink and buy when you visit?? Here are some suggestions in no particular geographical or preferential order! 1.The Giant’s Causeway, Antrim – this magnificent natural phenomenon has inspired people for centuries and spawned the infamous legend of the giant Fionn MacCool who built the a path across the sea to Scotland so that he could visit his lady friend. How romantic is that? And this story seems somewhat feasible when you see the regularity of the size and shape of the basalt columns which stretch from the Antrim coast to the Scottish island of Staffa where the lovers would supposedly meet. This windswept place certainly has a magical feel to it which will either bring out your romantic side or a new found interest in geology! 2.The Guinness Storehouse, Dublin– Ireland’s most visited attraction and a staple in the itinerary of any visitor to the capital. Most people race around just to finish in the Gravity Bar and sip their first proper creamy Irish Guinness with the 360 degree view of Dublin city surrounding them. On a clear day you can see most of Dublin city laid out before you…..on a bad day probably just your reflection! 3.Ring of Kerry, Kerry – breath-taking, spine-tingling, awe inspiring - all pretty much sum up the draw of this captivating region. With crashing coastlines, rugged mountains, sandy beaches, and wild seas - interspersed with picturesque towns and villages; the Ring of Kerry really has it all. Just don’t forget your camera! 4.Claddagh Ring – a symbol of love, loyalty and friendship for centuries and depending on how you wear it (heart pointing in or out) or on what finger, allows the wearer to alert people to their status, whether married, engaged, in a relationship or on the lookout for one! Most Irish people have a Claddagh in some form – ring, bracelet, chain or earrings, some with a stone in the middle for the heart, some in gold or silver. It doesn’t really matter how you wear it or in what form, but you should definitely pick one up when on your Irish vacation as a reminder of your time on the Emerald Isle. 5.Newgrange Megalithic Tomb, Meath – dating from 3200 BC it is Europe’s most important and notable passage-tomb, predating the Egyptian Pyramids. This is a magical and spiritual place with centuries of history pulsating and reverberating through its very core. The tomb is accessed through a narrow passage way which enters into larger chamber with a roof that reaches some 20 feet. It is an amazing feat of engineering and architectural prowess - clearly illustrated when you take into account that the very design of the tomb was constructed in such a way to allow the sun enter annually through the roof-box on December 21st and illuminate the chamber within. Each year a lottery is held to allow a chosen few enter on this date to experience the magic for themselves. Put your name in the lottery when you visit – you never know you could be one of the lucky ones! 6.Grafton Street, Dublin City (at Christmas) a favorite of mine at all times of the year but particularly during the festive period. The lights are all sparkly and twinkly, people are dressed in their winter best and street performers and buskers duke it out for the crowd’s attentions amidst all the hustle and bustle. Christmassy, wintery scents fill the air, carols creep out from the shops and wind themselves into your subconscious and the whole experience is topped off by a warming hot chocolate from Butlers…..
7. Galway City, Galway - The City of the Tribes is a great town to visit and really exemplifies the charms and friendliness of the West of Ireland. Easy to navigate with winding streets that snake their way around the city, you can happily get lost in Galway and while away a few hours enjoying her markets, shops, galleries, restaurants and pubs. Lively and invigorating this is a multi-cultural town with an unmistakable Irish feel to it, and it is this unique blend, which makes Galway so popular amongst both domestic and international visitors alike. Great food, friendly people, talented musicians and singers crowd this vibrant city and once you visit, you will be planning your next one before you even leave your last! 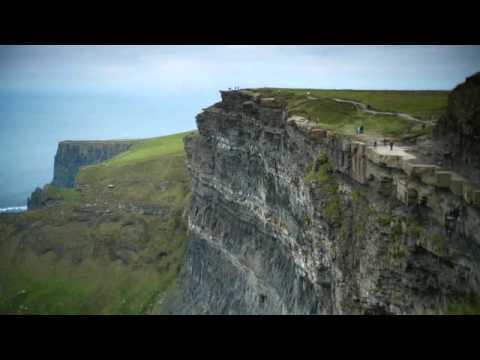 8.The Cliffs of Moher, Clare – it is difficult to put these majestic cliffs into words. Towering some 200 meters and over 8 kilometers long, their beauty is simply spine tingling. Some things are better seen on a good clear day, but for these cliffs their dramatic aesthetics are just as breath-taking on a summer’s day as a winter’s. With the crisp sea air filling your lungs, mists seemingly as old as time swirling around you and nothing to see but the playful sea-horses, this is a breath-taking visit and one that will stay with you long after you return home. 9.Kylemore Abbey, Galway – set against the backdrop of the wilds of Connemara, this wondrous castle is a testament to the love Mitchell Henry had for his wife Mary, and for whom he built this gorgeous estate for. With an intriguing history full of lost-love, tragedy, gambling, royal visits and even a band of exiled nuns in the mix, Kylemore’s story is as intriguing as it is inspiring and is arguably one of Ireland’s most expressive gestures of love. 10. Wild Atlantic Way - This is a spectacular driving route some 2,500km long which takes you from Ireland’s most Northerly point in Donegal to her most Southerly in Cork and all along the magnificence of the Western seaboard. Wild and untamed, the unbridled beauty of the Western coast offers up an abundance of islands and cliffs, beaches and headlands all infused with the Heritage and History of Ireland, her songs and traditions and of course the locals – from hoteliers to chefs, craftspeople to musicians. Explore this route at your leisure and see the Ireland that only the locals know. 11. And no matter where you are in Ireland or for how long, you should definitely sample the craic and ceol (fun and music) of a traditional session. Most pubs will have traditional singers, dancer and musicians on at some point during the week, and so whether you enjoy a pint with an impromptu session in a pub, or a more structured show, do make sure you enjoy the sounds of the Celtic soul. The Irish are great story-tellers and this gift has certainly transcended into our songs and melodies and with a plethora of talented traditional musicians around you are sure to enjoy a session somewhere! So sit back, enjoy and feel the Celtic spirit ignite your bones. These are just some of the things, I think you should include on your visit to Ireland, but there are still so many to enjoy! From the vibrancy of Limerick city to the spirituality of Glendalough, to the hustle and bustle of Belfast and the calms of the mysterious Burren you are spoiled for choice! Make sure Ireland is on your bucket list and Get a Quote today!